One of the best things about attending a quinceanera is the dancing that takes place once everyone has eaten and her family has presented her as a young woman in accordance with tradition. Since most of your guests will be spending the majority of their night on the dance floor, it’s important to decorate it. 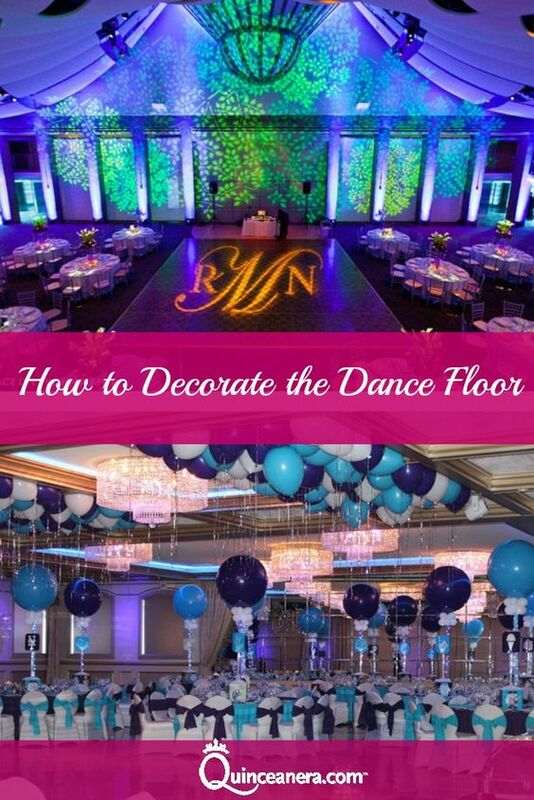 If you’re currently planning your upcoming quinceanera party, look over these 5 awesome dance floor ideas for a little inspiration. Balloons – Quinceaneras have been decorating their dance floors with balloons for years. The best thing about balloons is that they’re affordable and easily fill a space. You could inflate balloons in the colors of your theme and leave them loose on the dance floor or have a balloon structure created to stand tall over your guests while they show off their best dance moves. Illuminated Monogram – Another fabulous idea for adding a little flair to your dance floor is an illuminated monogram. Many event companies or Djs provide the projector that is needed to illuminate a cut-out of any design. You can design your own monogram to include the initials of your first, middle and last names or have one made by a professional graphic designer. Streamers – Many people love the way streamers look hanging in a neat pattern over the dance floor. They’re also really inexpensive and come in a bunch of different colors and textures. Drapery – Decorating your dance floor with luxurious drapery and colorful up-lighting is a great way to create a classy ambiance for your party space. String Lights – A dance floor that is lit up with some dangling string lights provides an incredibly sweet and romantic event space. These days, string lights are available in a variety of colors, so you’ll most likely be able to find ones to match the colors of your party décor.